I would say come in with an open mind. Be sure to pack air tight bags for your dirty clothes, extra deodorant, and even peanut butter and jelly in case the food upsets your stomach. Bring a computer and flash drive. Everyone is very willing to share their lessons and this is super helpful. Bring shoes you can wash off in the shower and old running shoes you are willing to leave. Last but not least be prepared to have an experience of a lifetime! Thank you again for allowing us to go. We truly had a fantastic time! To be a part of this program has been so amazing. 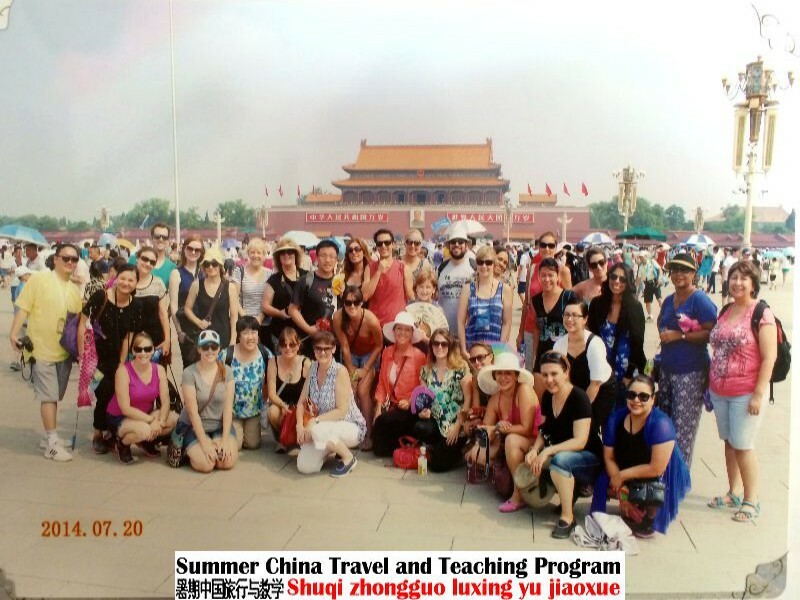 I feel so fortunate to have been able to travel to China along with so many great teachers. The program is so well organized, and put together. I remember walking into the school and how excited the kids were to meet us and how excited I was to be a part of this great program. The organization was excellent. I loved traveling at the beginning and end of the trip. The places we were able to see just amazing. There were many days I just wanted to pinch myself and remind myself how lucky I was to be a part of this program. The school site was great. If we needed anything, it was there. All the people were so nice and welcoming to all of us. They treated us like professionals, and I always felt so welcomed. My favorite culture class was the painting. I loved being able to come home with my bamboo and I can also teach the technique to my students as well. I loved the tea ceremony along with the tea set, but I think it could have been held in a better location. Some people had very good seats while others did not. The ceremony was great though, and I think every other person going to China would love that. The food at the school was good most of the time. The dinner celebration was amazing. Toward the end of the second week, the food wasn’t as good. We did not go to the cafeteria as much and even ordered pizza once because the food wasn’t as good. The second week food wasn’t as good as the first week in my opinion. The accommodations were all pretty nice. I was happy with every room. They were much better than I had anticipated, so I was very happy! In Nanjing our room was in such a great location. The park just across the street from out hotel made it so easy to enjoy all that was going on there! The tour guides were all great! Henry did so much to help in all situations and I especially liked our guide in Beijing, she had so much information for us! I can’t say enough about how great they all were to us! I had an amazing experience, and I can’t wait to tell my students when I return to work. Thank you for letting me be a part of this program! The organization of the program was excellent--10 out of 10 stars! Communication pre-trip was excellent and so helpful, as well as communication during the trip. I don't have any suggestions for improvement about the organization of the trip. I was very impressed at the high level of preparation and organization that has taken place for this program to go so smoothly. The management of the program on the school site was also excellent. I felt that I was kept in the loop about what was happening, and there were no surprises. I loved the school program leaders we worked with and felt they were all more than competent and professional. All around, excellent experience. One thing that was maybe a cultural difference and did make me uncomfortable was when we were asked to comment on our room teachers and later found out they discussed this in a staff meeting. Luckily for me, I could honestly say that my room teachers were great and happily said so when asked, but there were others on the trip that did not comment on their room teachers and felt very badly about it after finding out that it came up in a meeting. The culture classes were really great--I loved the painting class the best, but all were interesting and helpful in better understanding the culture. I enjoyed all of them. I think it would also be interesting to try some of the electives the students were doing. For example, making dumplings (or another cooking kind of class). The food at school was great--I didn't eat there every day, but there was always plenty to choose from when I was there. My favorite dishes were dumplings, shrimp, and sweet and sour chicken/pork. My least favorite dishes include anything with tofu. Just a personal preference--I don't like tofu. The accommodation in the cities that we toured in terms of location and service was great. You will hear no complaints from me! My suggestion to future teachers regarding trip preparation: read the emails, read the packets, and you'll be fine. Suggestions about teaching and traveling in China: trust yourself. If you travel frequently, do what you would normally do. Don't read all the suggestions and fill up your pack with things you would never bring when you travel. If you forget something, you can get it in China. Try everything you can and be open to new experiences. You don't have to be outgoing during the whole trip--if you need quieter time, take it and don't listen to people complain about it (those who don't need a lot of down time will likely complain--ignore it). There are lots of different personalities coming together and if we were all the same, it would be no fun. Do bring the proper technology for teaching--I didn't bring any teaching materials other than my flash drive loaded with songs, videos, and ppt lessons. It was all I needed. Keep your lessons visual and conversational. You don't need all kinds of teacher stuff if you don't normally use it in your classes--there are lots of leftover things in the teacher wor room to supplement your digital files. I brought temporary tattoos for prizes--they took up a tiny bit of space in my pack and the kids loved them. The teaching portion of the trip was so enjoyable--the kids are really great and so lovable! We were given some teacher inservice/training before classes started. I tried out some of the new strategies--this is a great time to try new things. Some of them work, some don't, but again: try it. My only other suggestion with this program is to enjoy it! You don't have to plan any of the travel accommodations and get to work with some amazing students and teachers--it is the perfect way to spend a summer! It was such a pleasure for me to be part of this program and was truly an unforgettable experience in the most positive way. Thank you for such a wonderful experience. Here is my feedback. The program was very well organized and the information provided in advance helped me prepare for the trip and teaching responsibilities. The information regarding travel dates, flights, and visa requirements was very clear and easy to schedule in a timely manner. Bravo Travel personnel were very professional and helpful in scheduling flights, extending my return flight arrangements, as well as suggesting a return flight to an airport closer to my home city, avoiding a long layover in L.A. Information regarding roommate assignment, and the opportunity to provide input regarding roommates, and information to help plan lessons was disseminated at appropriate times in manageable quantities. The management of the program on the school site was very supportive. Sally, Faye and the others were available to answer any questions or meet our needs. The school anticipated many of our needs by providing plenty of bottled water, tea, coffee, soda, lounge chairs, computer & printer, and some supplies in the teacher workroom. The session led by Faye on our first day at the school was very informative, and the information presented about the school and program was very impressive. The opening and closing ceremony was well organized and the crowd was super enthusiastic! The food at school was always ready on time, and served in a clean and inviting environment in the teacher's lounge area of the cafeteria. We could always count on tea, bottled water, Coca-Cola, and rice as every day staples. The menu varied each day and I was always able to find a few dishes I liked. A great variety of vegetables and meats were served, although prepared differently than what I am used to. I really do miss eating with chopsticks! The accommodations in the cities was what I expected for 3 star hotels in China. I enjoyed staying in hotels that were in areas more authentically Chinese, and off the tourist track. In Beijing, from our hotel we were able to walk to a wonderful grocery store with all types of fresh produce and wonderful teas, and shop among the locals. Unfortunately, I didn't make it there until the last day in Beijing! Due to the fast pace of the itinerary, if I wasn't comfortable in one of the hotels I wasn't there too long which made it bearable as we weren't in our rooms much due to all of the tours and full schedule. I was concerned about the hard beds as stated in some of the other reviews, and although they were different than home, they were comfortable enough and I didn't have any trouble sleeping good throughout the tour! Showers and toilets were all very acceptable in the hotels. All the rooms had hotpots, which was nice for morning tea or instant coffee. Henry was a good guide and offered us extra tours which most of us took advantage of. Our female guide in Beijing was also very good and provided interesting commentary about life in Beijing, in addition to our tour site information. I recommend this program as a way to experience Chinese culture, and enjoy tours and attractions in Chinese cities, but the highlight was the opportunity to teach Chinese students! I really miss my students right now! Thank you for providing me with such a rewarding experience, Sally. I taught first grade and the students were eager to learn. I focused a lot on English speaking and listening skills using many literacy based materials I brought with me. I also used some fun, interactive DVD's that helped with English pronunciation, short and long vowels and vocabulary. I also had scanned several books such as, Dr. Seuss' and other beginning readers that the students and I read together as they projected on the screen. Since the ability level of the students varied, this group reading activity helped the lower level students feel more confident in their English speaking skills. The classrooms have projectors and document cameras. The laptop I brought had a DVD drive and I used it daily with the classroom projector. The books that I scanned were very useful as part of my daily lessons, and I used a flash drive for those, but also had them saved on my computer as a backup. I didn't have to rely on the Internet once I arrived in China which was beneficial since the VPN I purchased wasn't that reliable. I also created an alphabet BINGO game (show alligator picture and students had to mark the A if they had it on their card - just saying the letter would have been too easy for the first graders!) and I took along many prizes for the students. They really enjoy games and prizes, and BINGO was new to them. The students seemed familiar with typical American songs such as "Heads, Shoulders, Knees and Toes" so I was glad I had some fresh new material as an alternative. Take back up plans! I also took some laminated alphabet place mat type cards and the students earned stickers to put on the back of their alphabet card. They seemed to enjoy the stickers, and it worked well to have a place to collect them kind of like a little sticker book. The Tootsie Rolls and Smarties were a hit as well. Looking back, I would have added a few more short cultural activities and crafts (such as a Valentine's exchange) and made time for those, although there were never any lulls in time for me! Advice - or what I know now for elementary level - I believe balance and variety is the key in planning. Don't spend too much time on crafts. Don't spend all your time reading. Don't just sing songs. Plan for a variety of learning and activities! As recommended by Sally and others, themes work very well! Take materials for sturdy name plates and tags to make on the first day. Take simple crafts, and everything required to complete such as construction paper, glue, etc. Fill your suitcase with teaching materials, prizes, treats and supplies and you won't regret it! The students will love it and appreciate your efforts! I am really pleased with the organization of the program, the timing was well organized, the information was very through, the support was great. I felt supported by the local staff such as Jim and the volunteer Benny. Sally and Lewie were very supportive on the days they were at the site. I did feel the teachers could have been more involved in class helping with discipline. I loved the tea ceremony and greatly enjoyed the painting class. The learning Chinese class was my least favorite although I did learn some helpful phrases but it is hard to cover much in such a time span; I still think it's valuable but if we had to change one class then that would be it and I would change it to something like learning a cultural dance or singing where we could participate as well. I enjoyed the food at school very much! I think it was abundant, fresh and varied enough each day. My favorite was the shrimp just because I love sea food but I also loved the chicken on a stick (not sure if that's what it was, but it was on a stick), the rice meatballs, broccoli, backchoi (not sure how to spell it), the fried chicken, chicken wings... Well a lot of the food, I was pleased. Location wise they were great! As far as service it was good as well. Tour guides were great too! Of course Henry has to be my favorite but mostly because we got to spend more time with him and create a stronger connection but the other two girls (Zoe and Nancy) were great too, very entertaining and lots of information. Overall this was a great experience for me both professionally and personally. It broadened my perspective and it gave me exposure to other ways of doing things. It allowed me to share and expand my teaching experience. This trip also allowed me to visit wonderful places such as the Great Wall and the Terracotta Warriors and so many more. Thank you again for the experience, it was wonderful! I feel that the organization of this program was phenomenal! Everything from our arrival in China until our departure was well thought out, coordinated, and taken care of. Every hotel, restaurant, bus trip, and tour were seamless and it made the trip enjoyable rather than stressful. The detailed e-mails leading up to our trip were very helpful and I can't say enough great things about our people on the ground in China (Patrick & John) who helped Mr. Mao make our trip extraordinary. Management of the program was well coordinated and we were accommodated very well in terms of materials that we needed, preferences in food that was served in the cafeteria, etc. Students were well behaved and our link teachers were very receptive to any of our needs during instruction. The culture classes were interesting and fun! I think the calligraphy was the best! It is hard to pick one that I would replace. I think that maybe the calligraphy and the Chinese painting were similar enough to each other that maybe one could be substituted with something else. The food at school was pretty good! It is cafeteria food so I think as in every place you go, it gets a little repetitive in taste and style. I think that my favorite food was the vegetables, sometimes soybeans or green beans mixed with various things were good! My least favorite may have been the squirrel fish. It is not that I do not like it, it was just very specific and overbearing to have almost every day. The accommodations in all of the cities were great! I was impressed that the rooms had very good air conditioning compared to experiences that I had read about and heard about from previous participating teachers. They were ample in space and the hotels did a nice job in providing English breakfast opportunities in addition to their traditional Chinese cuisine. The only thing that I would say, in comparison to the other hotels, is that the beds in the hotel in Suzhou were very hard, almost like a box spring. It wasn't a huge deal when you consider that you need to be flexible while traveling in another country and we got used to it. Some people bought pads or extra blankets to put on the bed at the mall next to the school. Our tour guides were very friendly and knowledgeable about the cities that we were touring. I think my favorite was Jack! People were correct in their advice to forgo bringing an umbrella, they're ridiculously cheap on the street if you need one. In regards to doing laundry, we were under the impression that we could bring a few varied outfits and wash our clothes in the hotel rooms in order to pack like a minimalist. One issue we ran into when doing laundry in the rooms was that it wouldn't really dry. I don't know if it was the humidity or the air conditioning but clothes took forever to dry and then we ran into the issue of them starting to smell. After one or two endeavors, most of us ended up sending our laundry out. We were very appreciative of the service that Mr. Mao set up as the prices were reasonable and they picked up and dropped off our clothing at the school! It is a good idea to bring a med kit of sorts with immodium, tylenol, bug bite cream, etc for anything you might run into on the trip. Honestly very few people had stomach issues on our trip but everyone is different and you never know. Pack light! I kind of shrugged off prior teachers' comments about bringing home souvenirs or gifts from your students but at the end of the trip it really is a battle to fit everything into two suitcases and make the required airline weight of 50 lbs per bag. You end up buying things for family and friends as everything is very cheap in the street markets. Plan to leave your teaching materials that you bring there at the school for your link teacher or others to use. That will free up some suitcase space. Never pay the full price that a street vendor gives you in regards to souvenirs. Everyone is selling similar things and they want to beat out their competition. They rely on tourists just assuming that is the price and handing over money. In some instances I was able to get items for 10 times less than the initial price that was given because they want to make the sale and you realize how much profit margin there actually is in the stuff that they are selling. In regards to packing, if I were to travel with the program again, there are many things that I would not have packed and would have waited to buy upon arrival in China. Availability and low prices make some things a no-brainer. Examples are shampoo, laundry detergent, rain poncho, school supplies like pens, post it notes, scissors, paper. There are many stores nearby in the cities that you tour and right next to our school in Suzhou was a 3 story mall of shops that sold everything you could imagine. As teachers from years prior had suggested, a prize/incentive system really is a tried and true way to make your teaching fun, to keep your students engaged, and to eliminate any negative behaviors in the classroom. The students love American candies, I brought bags of starburst, tootsie pops, just be careful with things that could melt in the heat. Before I left, I printed and pre-cut positive behavior tickets (i taught 7th grade). This was a great time saver and a good way to distribute prizes. Students would receive tickets for participation throughout the lessons and then at the end of class they could trade them in for candy, stickers, pencils, etc. When traveling around cities that you are touring or the city where you are teaching, always be aware of your surroundings. For instance it is good to know what subway stop your hotel is located near, what streets you are on, so that in emergency or if you get separated from the group, you can find your way back. Also be careful in traffic as the electric scooters are silent and pretty much follow their own rules. While many people were able to access Google, Youtube, etc through a VPN service (virtual private network), it is still a good idea to grab as much digital media as you can prior to leaving and put it on a flash drive. In regards to the VPN service, "ExpressVPN" worked the best for us and is around $10 a month. Download as many youtube videos and songs as you can think of before you leave even if you may not use them. You really won't know how you want to go about topics until you get there and having more supplemental materials is better than having not enough. In regards to lessons students were very fascinated by things that we have in North America that they do not in China. While this includes holidays like Thanksgiving and sports like American football, even little things we take for granted were amazing to them. I did a lesson on animals and many of them had never heard of or seen things like a moose, raccoon, buffalo etc. For men, I would really suggest getting a passport wallet. I have traditionally traveled internationally by wearing one of those pouches that are worn over the shoulder or around your neck and then under a shirt to protect and not misplace your passport. I purchased a wallet before leaving that was slightly bigger than my regular wallet and fit a passport on one side. It was about $10 on amazon, I believe the company is "travelambo." I felt like it was a life saver as we had to take our passports with us but also take it out various times throughout the day, be it at hotels, give it to your tour guide, then get it back from your tour guide to hold onto several times per day. Some people were constantly wondering where they put theirs (hotel room vs. in their bag vs. on their person) and I always had mine right in my pocket with my cash and credit cards. One thing that I disregarded in the suggestions from teachers who had traveled in years prior and then wish I had followed through on is bringing food and snacks. I thought to myself, I don't need granola bars or oatmeal, I'm not a picky eater I'll love the Chinese food! Its not that the food isn't good, but sometimes you just need a break from that type of cuisine or you don't have time to make it down to the hotel breakfast because you are skyping with your family, etc. Situations come up and you might not feel like eating what is provided, or you might just be on a long bus trip and want a snack. I would bring easy things as mentioned like oatmeal, granola bars, trail mix, etc. There will be a pot in your hotel room to boil water. Have a blast and enjoy every bit of the experience it truly is humbling and life-changing! Thank you for everything Sally and for the opportunity to be part of such a unique and amazing program. I hope to be able to travel with you again in the future as this was a very enriching experience not only for the students but for us as teachers as well! The program was well organized and "as advertised". I was of course lucky to have the roommate I did. I think you matched us very well, and I could see how a slight variation in some personal things could skew someone's opinion of the trip. Everything here in my opinion was also handled well. There was plenty of help before and during our time there. I thought Lewie's lesson before we began teaching was perfect. He is a great fit for the program and I learned a lot from him. Having taught in Korea before, and being familiar with working with staff like this, I thought everyone was very friendly, helpful and easy to work with. I can't eat wheat, so I am often picky about what I get to eat. But everywhere we went there were so many choices, I enjoyed each meal really. The food at the school was good. I liked the fried chicken and the kung pao chicken dishes best. The organization of the program in general was superb! Really. The information packet had so much information and was extremely helpful. The deadlines to get things done in the planning months were helpful (although stressful when we only had a very short time to do something). The management of the program on the school site was also really good. I felt like the school went above and beyond to give us everything we needed and make us feel comfortable. It was nice having --- there for us; he really did save the day a few times for several people. It was also nice having Sally and Lewie there every other day as another resource or person to talk to. I have very mixed feelings about the end of the year ceremony. I get the idea and it is quite nice to have a culminating event at the end of everything – it was quite emotiona and may have been one of my most memorable parts of the tripl. BUT, only having 11 days to prepare was quite difficult. On the one hand, I would recommend telling teachers to start practicing very early on….in the first couple days. The time off in the middle of the day (am and pm classes) turned out to be amazing for collaborating. I learned SO much from the other teachers and grew more professionally from that time than from most of the pd days in the last 10 years!! At first, I thought it was going to be annoying and a lot of wasted time but I wouldn’t trade it. I had no issue with either location or service. LOVED the location in Nanjing next to the lake but you already knew that . The lights were hard to figure out in X’ian! The location in Beijing was probably not the greatest – but it didn’t matter much as we were barely there and there was a supermarket/mini mall very close by. I’d recommend more strongly that future teachers learn a little bit of Chinese before going. At the end, we found some things like Shao Lan’s Chineasy on youtube and some Ted talks that were helpful and gave some easy ways to understand the symbols. Make sure you have room in luggage to take back a lot of things --- sooo many gifts from the students. Maybe not buy so many souveniers until you see what the students give you. *This might not be the best general advice as I know some teachers (especially at high school level) didn’t get many…but it was a problem for a lot of people. ***It was an extremely well organized program with an obvious interest in the teachers’ experience and ways to improve. It’d be really hard to outdo this program – I can’t express how thankful I am for all it had to offer in so many ways (professionally, culturally, personally, and travel experiences).